you can rally all you like over the early season races; that tour down under thingy and the one in saudi arabia somewhere, consisting of endless sand and roads that wouldn't know a corner if it offered to buy them an orange juice. no wonder there's no king of the mountains jersey, as there's barely a humpty back bridge for consolation. the race season simply means zip until the spring classics, and that, for 2011, meant today's omloop het nosebleed, a stunning 203km ride through the backroads around gent. rain, mud, gloop, armwarmers, bib knickers and puddles; what more could a cycle fan ask for? that's the true meaning of pain and suffering (even more so if your name is juan antonio flecha), for none of us would lose a wink of sleep if they filmed it in black and white. the sport is built on races like this, and it not only annoys but confounds me that it is derogatorily referred to as a semi-classic, along with its sunday partner in crime, kuurne-brussels-kuurne. with several of those of my acquaint and many more who suffer not from such association, uttering whoops of delight before, during and after the omloop, surely that is enough to confirm its status as a true classic? who but the uci would allow the real season to start with other than a classic? cycle racing does not do support acts. it is this degree of obsessive fandom that brought my saturday ride to a premature close. spring has sprung in the hebrides which, with the exception of the odd shower or two, led to blue skies and a sense of warmth that was more the emperor's new clothes rather than true temperature rise. the fabulous interweb stepped in for the embarrassment that is eurosport who singularly failed their cycling audience by providing no coverage whatsoever. i sat, still clad in winter jacket, bibtights and colnago cap from 47km to go right to the bitter end, despite two browser refreshes when the picture and commentary irretrievably stalled. ruddy brilliant. 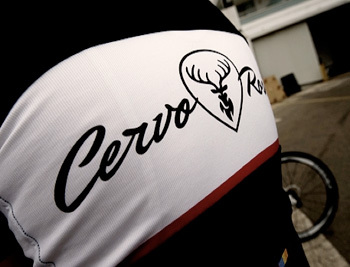 and it is also this degree of obsessive fandom that provoked carlyle ware to build a new brand of cycle clothing with the rather fabulous name cervo rosso which, for no real reason i can fathom, always reminds me of espresso. must be the double esses. it will not have escaped the attention of many, that cycling is particularly well served in the apparel department. why on earth did carlyle feel the need to add cervo rosso to the throng? "As an avid competitive road cyclist l have always enjoyed the demands of the sport in terms of personal fitness and achieving my own personal goals. Additionally the thrill of being up close and personal to the professional scene is very inspiring for an amateur rider like myself. The drive to establish Cervo Rosso as a performance brand is largely due to this raw passion for the sport, but also based on my ongoing search for a brand that represents the perfect balance between the heritage of European road cycling with modern styling and the right technical functionality of cycling wear. There are many brands great brands out there that have provided a lot of inspiration, but I'm not convinced that anyone of them have found the right balance of performance, functionality and style that satisfies my hunger!" carlyle confesses to having been a b grade amateur rider, something that gave a taste for the competitive edge and at least a racer's insight into the needs and wants in the clothing department; basically what works and what doesn't. 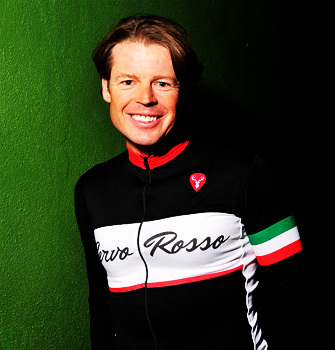 but with acceptance of my foregoing premise that we're in danger of being suffocated by cycle clothing, what makes cervo rosso different or even the same? "Many factors but primarily, hitting the right balance of clean classical styling, a genuine passion for the sport (which provides a real personality behind the brand) and having the ability to choose the right technical requirement for the garment using a number of different manufacturing techniques and fabrics. 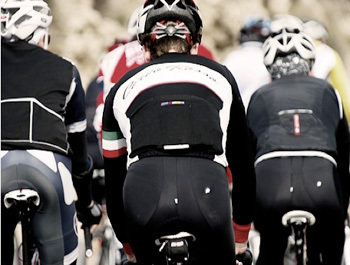 We produce in sportwool, Lycra, Polyester Blends and even 100% Merino Wool. We are not restricted to the last roll of fabric we bought. "What has made Cervo Rosso so popular so far is that our customers have a very strong sense that there is a genuine passion and interest in us wanting to provide them with something very different. We are not about putting our brand on as many products as possible. We want our riders to feel that not only are they wearing a very high quality item, but they are part of something very unique and special that is growing by the day. There is a strong community sense to the brand at the moment where Cervo Rosso riders want to know more about each other (see community map link on our website) This has created a lot of interest, to the point where customers are initiating events for CR Riders in their local areas." the harbouring of cycling fabulousness in central europe is hard to mistake when races are referred to as omloop het nieuwsblad, kuurne-brussels-kuurne, ronde van vlaanderen and brabantse pijl. none of those names are in gaelic. so perhaps it is not surprising that cervo rosso are far from the inner hebrides, based almost slap bang in the middle of the map; switzerland. we are all likely aware of the preponderance of mountains encapsulated by this neutrality, offering a playground for the aspiring grimpeur, but given that a substantial percentage of the cervo rosso offering pertains to the well-dressed commuter, does the country have a sizeable population that cycles to work? "Yes but not as much as markets like Italy, the UK, Belgium, The Netherlands and Australia. What it does provide is an excellent standard in product quality. There is very strong association between Switzerland and quality products. 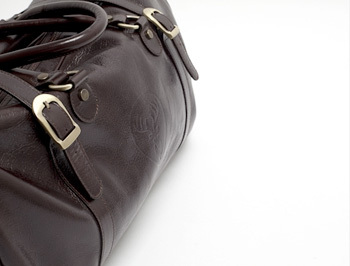 Cervo Rosso is by no means is an exception here." in which case, does carlyle see clothing for the committed commuter to be a potential growth market? "Yes totally. In fact our CR Urban Collection is very much geared toward city riding, commuters and even the single speed / fixie culture. We will be developing our offering in this category further over the next twelve months, including some pretty cool local level events. We have a very good manufacturing partner here in Switzerland who has a very strong heritage in clothing design and production for city riders." if you've had the chance to peruse the cervo rosso website, much like fifty percent of the pages of rouleur, colour is kept to a minimum. in fact pretty much all the road-going garments are fashioned from black, red and a smattering of white. are there any specific reasons for this restricted palette? "Clean and classic. Not cluttered with to much 'noise' and hopefully timeless. If you buy a new bike, we hope that you don't need to change your Cervo Rosso gear each time as well! The colors are very complementary to various bike color schemes." as mentioned by carlyle above, the brand received its genesis from "a raw passion for the sport', and in order to conserve momentum, it is only right and proper that this raw passion is reciprocated by involving oneself in the very sport that provided that initial and continuing enthusiasm. many others have done so through race teams and race sponsorship; in this, cervo rosso is no different, providing endorsement of brian ignatin's classics series in philadelphia usa, the first of which, the hell of hunterdon, takes place on march 26, and the fools classic on april 2. with an even greater distance between switzerland and philadelphia than to islay, how did that happen, and could this be viewed as an opening salvo aimed at the american market? "Yes, very much so. We will do this through a grass roots level where we actively support community and local level events, such as what Brian is creating with his series. It's also great to bring a little bit of the European flavor or rode cycling to North America. There are growing base of customers who appreciate our interest in doing this for them in both the US and Canada." the cervo rosso website is not devoid of content; there's a substantial range of clothing on offer, suggesting that carlyle ware has done his homework before committing sublimation to polyester and lycra. who would he identify as the typical cervo rosso customer? "Wow, that's a really good question. As a professional marketeer and having had extensive experience in brand building (albeit in the pharmaceutical Industry) you always try to create a customer target and profile based on their needs. For us this is primarily the competitive road cyclist and Sportive / Gran Fondo rider. They have been largely males between the ages of 25 - 50. However recently two additional customer groups are emerging and showing tremendous interest in the brand: female road riders and single speed / fixie riders. Both customer groups will have specific product offerings developed for them over the coming months. "What has been really nice for our Cervo Rosso customer group so far, is that they are defining who they are as opposed to us trying to present the 'Cervo Rosso Rider' to them. We will maintain a very strong focus on the competitive road cyclist, but we are very excited about the crossover into other customer groups." all that, however, is entirely academic. think not of chamois pads, mesh bibs and full-length zips, nor, indeed of leather weekender bags, commuter caps or anything made of merino wool. the home-page tantalisingly displays a red and white cervo rosso emblazoned volkswagen camper van, reminiscent of scooby doo's mystery machine but with windows on the side. before we commit to black, red and white for those moments of rouleuring on a sunday morn, i think we should know whether carlyle actually has just such a vehicle locked in his garage. "No, but we are looking for a 1965-1970 Model. If anybody can help, please contact us! We have the color segways and brand element layed out for the Combi, we just need to find one that will get us over the Tourmalet or up the Muur without overheating!" 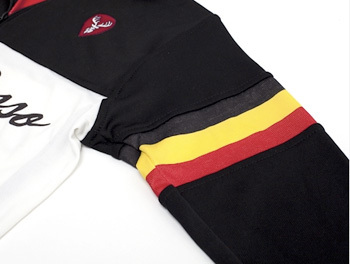 you really can't knock someone who has put this much effort into providing us with classic clothing for that sunday ride or, raising our game just a bit, perhaps the etape du tour, hell of hunterdon or the race named after yours truly, the fool's classic. it will not, however, be left wanting, as i hope to be reviewing specific, yet to be revealed clothing, from the cervo rosso wardrobe in the foreseeable future. if i'm really good, perhaps it'll be delivered in a red and white veedub camper.